A healthy dinner in 15 minutes is music to my ears. This healthy chicken salad is one of my favorite quick go to meals when my days get busier than I can keep up with. We need to be so careful not to blow a great workout day by quickly grabbing a meal on the go that sabotages our earlier efforts all because of time restraints. In fact, if your house is like ours, we have a lot going on every day. Lessons, practices, school, work, social events, you name it, there always seems to be something almost every afternoon. Busy schedules make it difficult to stay in the kitchen long enough to plan and prepare healthy meals, especially if you are like me and just don’t enjoy cooking. I like the easy, healthy dishes, but they can be difficult to find sometimes. The other night was one of our more crazy evenings when it would have been very easy and justified to grab something to go from a local restaurant but after the holiday junk we had been eating, I was determined to have something healthy. 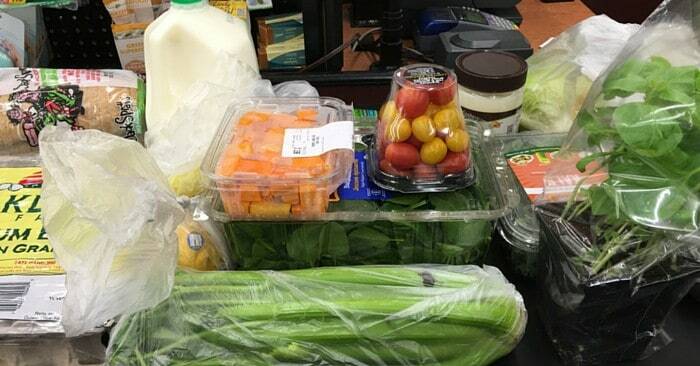 A quick run by the grocery store proved to be a jumpstart to a healthy week. An easy, quick, healthy meal can be made in minutes from picking up something as simple as a rotisserie chicken from the grocery store. What’s even better is not hearing the kids complain about dinner. Kids are happy, we’re happy! The kids eat the dark meat – their favorite part. Andrew and I have the white meat. 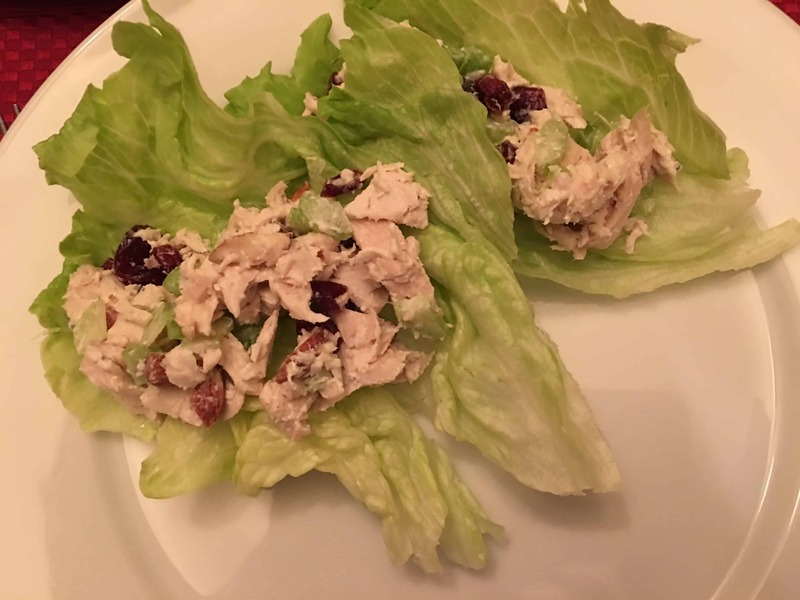 Healthy dinner in 15 minutes is an easy, great tasting chicken salad tonight! I chopped and shredded the chicken breast. Chopped up a little celery and almonds. Added dried cranberries and only enough mayonnaise to hold everything together. Served on lettuce for a wrap to give an added crisp crunch that prevents me from grabbing the crackers. We also had some soup made fresh at the grocery store that helped warm us up after a cold wet day outside. Healthy dinners don’t have to mean hours of prep and cooking. Healthy dinners in 15 minutes like this one is great to have in mind for the craziest of days. Speaking of a cold, wet day. 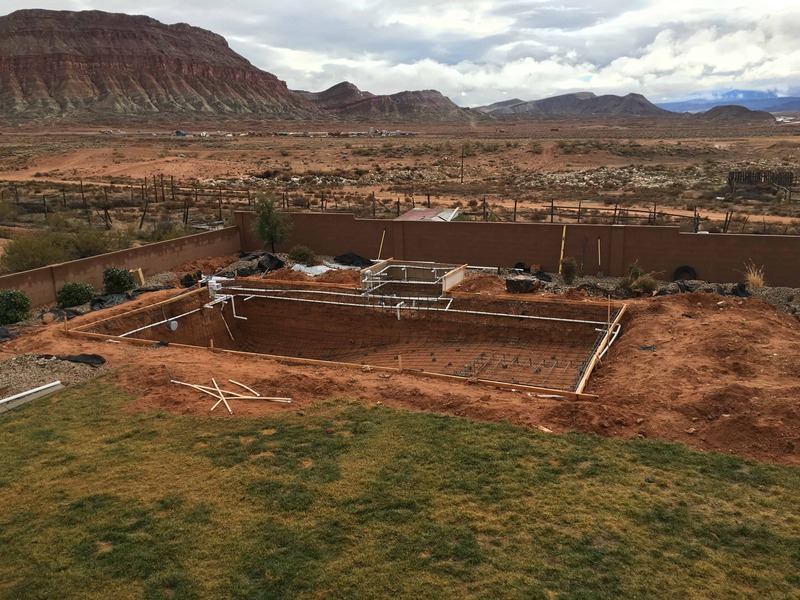 The pool progress is slow this week. The plumbing has been added, but everything else seems to have come to a halt due to the off and on rain we have had all week. Today is day 3 of the 30 Day Fitness Challenge for Women Over 40! Yayyy!!! Let me know how it’s going for you! Make sure you are staying hydrated throughout the day, eating the right calories (protein, protein, protein) and getting the proper rest so your body can keep up! I’m sure you are doing great. Pop over to the Facebook Group or comment below. Rolled oat porridge with hemp,chia and flax seeds and a bit of brown sugar or honey to sweeten is a good breakfast for me. I am drinking more water and I feel good. To be honest, not looking forward to the workout tonight as almost every muscle group is sore but I am going to give it my best. Thanks for the encouragement! That is a great breakfast, Barb! Make sure to stretch out well before and after your workouts. Hope the workout went well tonight! You are doing fabulous! So are stretches the best warm up/warm down? I was wondering. Hi Barb, That’s a great question! Actually a few minutes of light cardio to get your blood moving well are the best for warming up. Jumping jacks, etc, and then a few stretches. I will create a post in the next few days to help with the warm up and cool down. Have a great weekend! Thanks so much, ready for week 2.